Cloud-based services open new opportunities for customers and companies to adopt reliable, easy-to-use capabilities. By moving to the cloud, businesses can expanded their reach or develop into new marketplaces. The innovative underlying technology enables global organizations to exploit economies of scale and provide new flexible cloud-based services to their customers, especially where security, trust and regulatory control are critical. Developing new services—utilizing ‘core investment’ to sell services through the development of public cloud-based services that can be sold to another organization (for example, a shared settlement service). While it is clear that cloud-based technologies represent a disruptive innovation in the way services and workloads are currently delivered to a customer base, cloud migration mistakes can be costly. To truly capitalize on the cloud, companies must commit to complete the due diligence and groundwork necessary to develop an integrated strategy that satisfies both the goals of business and IT. Not all workloads are created equal. Organizations must be able to identify and detangle the interconnecting business and technical parts of a workload before it can be made cloud-ready. 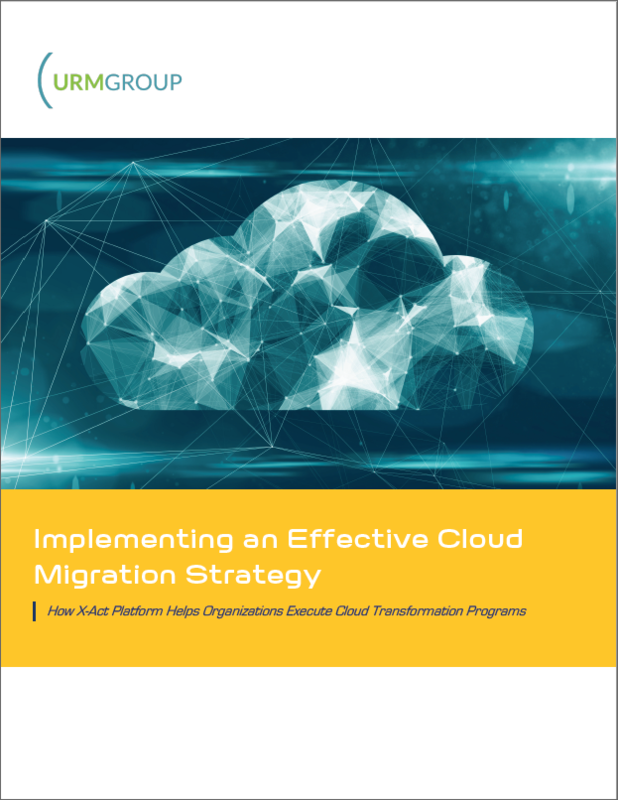 This paper explains how the modeling and predictive capabilities of X-Act®platform help COOs and CIOs build an integrated strategy that clearly determines how cloud-based services can best be utilized. With clear intelligence of the optimal service commitments for quality, quantity and continuity balanced against cost for each critical business and IT workload, X-Act users are able to execute a migration strategy that consistently achieves the desired result.